Is this some kinda joke or somthing? About time you get your own page PK !!! Ehh it happens. I think theres one other one I owned. If this reunion thing happens me and my friend julia are going to make a trip out there with my firebird. Hell if its during the summer it would be one hell of a fun drive. ... how do you post pic. Oops... forgot to say Welcome!!! bump before page 2 .... !!!! Wow... Andy's speech totally blew me away. I wanted to let everyone know that the flag is flying high at Frazee High School as of Monday. Tyler, Carter, and I stopped by to see it last night on our way home. We didn't realize it had already been raised until yesterday afternoon, so I am not sure if there was any fanfare with that. Tyler opted out of the ceremony in front of the school because he again is not one to enjoy the spotlight but also because it is hard for us to plan things as well. Some days he's tired, some days he is in pain, some days he just doesn't feel like getting out of bed, some days he feels good. Hopefully everyone understands Tyler's reasons behind opting out. I am sure it is tough to feel like everyone is always looking at you and I don't know if I could have handled everything that has come his way half as well as he has. The cold weather also adds an additional stressor to planning outings, although Tyler and Carter did manage to hijack me and we were in town about 3-4 hours last night. I think I am more pooped today than them. Anyway, I plan on stopping to get a picture of the flag today at the school, will take pictures when the Guard comes to our house, copying Andy's speech, and then I am sending the whole works to the local Frazee paper as well as Detroit Lakes paper. Any suggestions about any other papers? I would like to send it to Andy's home town paper - I need to know what the name of that if anyone has that. I want everyone knows what Andy did for our family and is doing for our country. 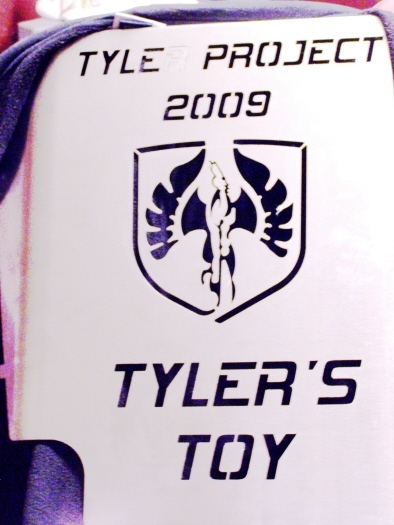 I know Tyler isn't a US soldier, but we are so honored that this was done for him. We fully understand the reasons you guys chose to opt out of the presentation. That is not a problem at all. For the photos/story that you want to send to the newspapers, the Star Tribune would like to run a brief followup to the car project, and I feel that the flag would make a good addition to the story. Tyler may not be a US Soldier, but he epitomizes and displays characteristics equal to the courage and dedication of those who are. Not sure how exactly to say it, but I believe it safe to say we've taken away from this project far more than we gave. Exactly my feelings. Andy in Iraq, and everyone who built the car, donated parts or facilities, and everyone who supported this in any way, or prayed about this. I think about how much Tyler has unknowingly done for us, how much we have taken away and how much it has shown us. So many hearts impacted by this, it is more than we can know. When I heard this song it made me think about this, the more I listened I realized what I heard was it talking about Tyler. 2.5 ---- that is one perty decent video !!! We are all better people for having adopted the Shipman family as our own, and contributing to this project. If ever there was an answer to the age old question, "what is the meaning of life", this was it. Great people all coming together for a great cause. Wow... Andy's speech totally blew me away. I would like to give credit where credit is due, and Chris helped to put my feelings into words with that speech. Thank you brother. Do you think Boyd H from Kare 11 should get one? He was as much a part of the team and is responsible for doing an excellant job of telling Tyler's story. I don't know how much volunteering of how many of these key tags can be made, but Karen and Dave at the auto shop are on the team as well. I would have to agree as well. I am sure he would like one. I haven't kept up lately--was the flag & case presented to Tyler already? I do believe so. I am waiting for photos. The story made Jalopnik, top of page right now! Can Frankie Muniz play me in the movie? I believe this is because of Jalopnik and Gawker.com linking. No, I do not, right now. At work, and that site is blocked. Dan I gotcha covered pm sent. Still no pics of the flag case presented to Tyler? Also haven't heard anything after the swap.